This week for maths we are busy finishing off work and posting it on our blog. 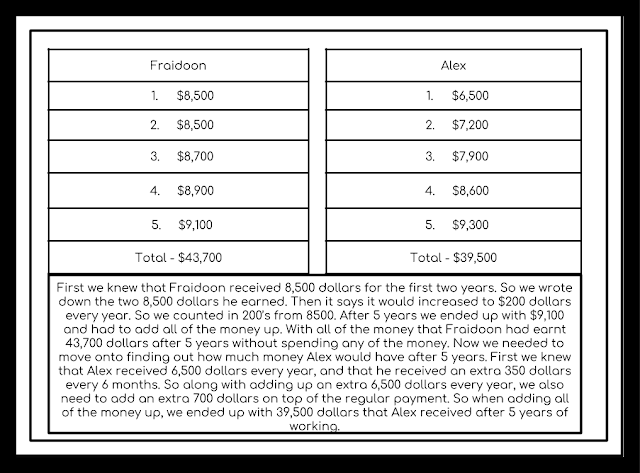 For one of our maths task we were given a maths problem about salary. I worked collaboratively with Sanujan, Ofa and Julian. At first we were doubting each other of which answers we were right or wrong. Then we went over the maths problem with Ms Kirkpatrick. At the end we were all wrong but we learnt a lesson by Occam Razor that If there is no evidence to the contrary, the simplest answer is correct. In this problem we tried to add up all the big numbers without using the calculator and and after we've got our answers it turned out to be right. I think next time we need to agree with each others opinions.